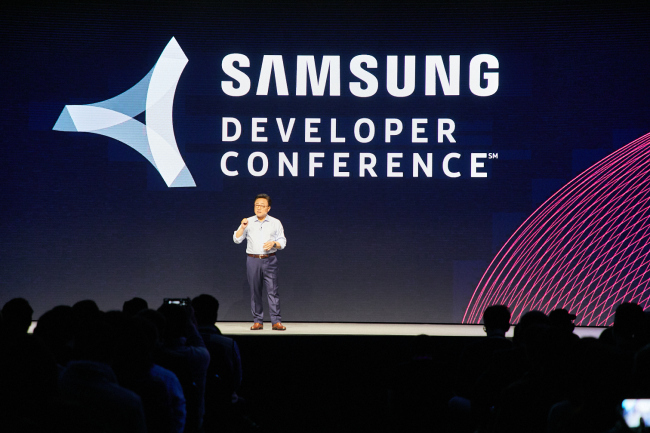 Samsung Electronics revealed an upgraded version of its artificial intelligence voice assistant, Bixby, highlighting openness and compatibility at the Samsung Developer Conference in San Francisco on Wednesday. “We are moving intelligence beyond devices and into an ubiquitous, personal and open ecosystem with introduction of Bixby 2.0 with integrated with Viv Labs technologies,” Samsung said in a statement. The technology of Viv Labs, which Samsung acquired in October last year, was for the first time applied to Bixby, Samsung said. Bixby, which was first unveiled in May, is regarded as incomplete, as it only works for a handful of devices in the Galaxy series and applications. The new version will be integrated with more of Samsung’s devices and applications. The Korean tech giant said the upgraded Bixby 2.0 will be available on a variety of devices including the Samsung Smart TV and Family Hub refrigerator. Samsung’s smart TV to be launched in 2018 will also have Bixby 2.0. Samsung said it will also provide the tools to bring Bixby 2.0 to a wider number of applications and services. The Bixby software development kit will be available to selected developers and through a private beta program. Bixby is expected to have further openness like Amazon Alexa. Since Amazon opened Alexa in 2015, it has amassed more than 15,000 skills through personalized voice application using Amazon Alexa. Multiple companies, including Samsung, Ford, LG and Huawei, are using Alexa for their products. Samsung is a relatively latecomer in AI-based voice assistant technologies compared to global tech giants, including Google, Apple and Amazon. Bixby had received an unenthusiastic response from users, with critics calling it a beta product rather than a polished release, as the system often misunderstood commands. Experts, however, say it is too early to judge Bixby, as the global voice assistant market has not yet even taken off. “The AI-powered voice assistant market is still in an early stage, even globally. Although Apple, Google and Amazon’s services are superior to the latecomer Samsung’s, all players are still at the starting line,” said Kim Jong-ki, a researcher specializing in the mobile industry at the Korea Institute for In-dustrial Economics & Trade. Apple first unveiled its Siri in 2011 through its iPhone 4s, while search giant Google unveiled Google Assistant in May last year. Amazon Alexa, which has a more than 80 percent share in the smart speaker market, was first released in November 2014. “Samsung still has a chance to catch up with global players capitalizing on enormous financial firepower, its own handsets and appliances and the acquisition of Viv Labs,” said Lee Byung-tae, a business administration professor at the Korea Advanced Institute of Science and Technology. Bixby is currently available on the Galaxy S8, Galaxy S8 Plus and Galaxy Note 8, which are used by more than 10 million users in around 200 nations.